Police stressed that it wasn't "an active shooter situation." Police placed a South Bay school on lockdown Wednesday as a precautionary measure after possible gunshots were reported in the area. 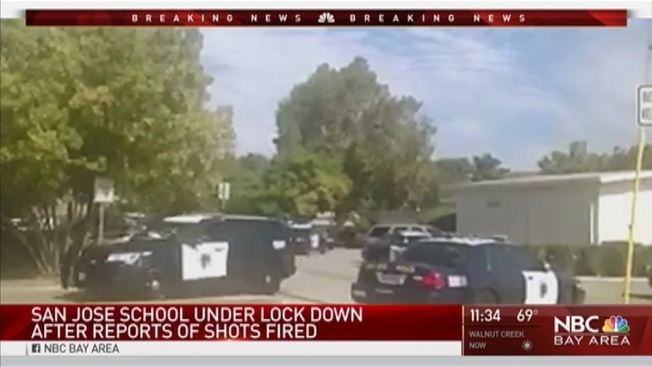 Officers responded to a secondhand report of shots fired behind the Charter School of Morgan Hill on the 9500 block of Old Monterey Road around 9:30 a.m., according to a police statement. School staff members heard sounds of firecrackers or shots nearby and alerted police, principal Paige Cisewski said. The school has been on semi-lockdown since about 9:45 a.m., meaning that students are allowed to go outside their classrooms to use the bathroom or grab their lunch, but recess and physical education classes will be held indoors, she said. The campus serves about 640 students in kindergarten through eighth grade, according to Cisewski. Officers swarmed the school campus and investigated the report. But police stressed that it wasn't "an active shooter situation." Parents appeared relieved as police officers told them their children were "safe." Police said no injuries have been reported.